Yesterday I did a reccy to find out what the trip would be like to get to the Lee Valley Velodrome using public transport. Getting to Stratford was easy enough, but on the WCC track day there will be engineering works on part of the London Overground service to Stratford until 12:30pm. This is unfortunate as the London Overground has good provision for taking (track) bikes. The signposting to the velodrome from Stratford station could be improved, as could my navigation skills, and I ended up taking a long way round to the track. 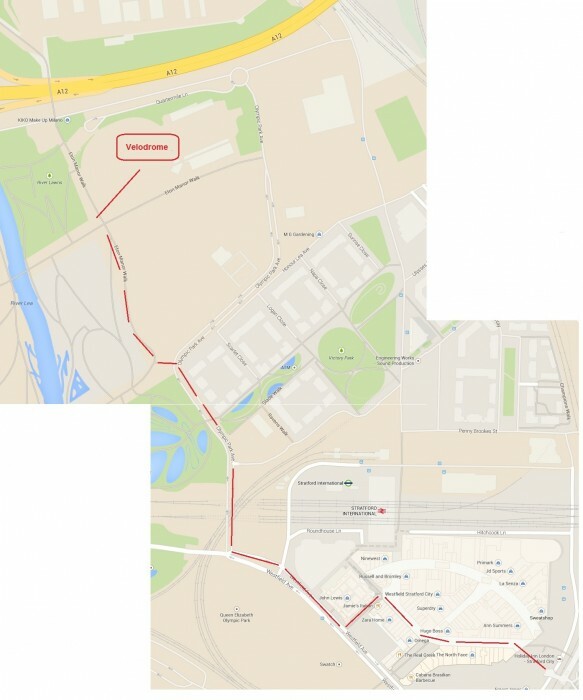 The trick seems to be to get on to the first outdoor level of the Westfield Mall when as soon as you leave Stratford station and then use “Jamie’s Italian” restaurant as a landmark (see rough map below). From there leave the shopping mall and get onto Westfield Avenue. Then walk along Westfield Avenue in a northerly direction. Then turn right into Olympic Park Avenue. When the Velodrome is clearly in sight turn left into Eton Manor Walk. Allow at least 15 minutes to walk there from the station. Car parking at the velodrome is limited with provision for perhaps around 100 cars. I am told you can park at Westfield’s car park for £8 all day at the weekend, so you may be able to drop off your bike and gear at the track then park at Westfield if there is no space at the velodrome, but allow plenty of time to do this. I found parking within 15min walk. its £6 for all day parking.